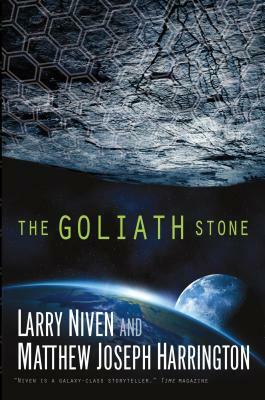 "The Goliath Stone "is a visionary new tale from Larry Niven and Matthew Joseph Harrington. Doctor Toby Glyer has effected miracle cures with the use of nanotechnology. But Glyer's controversial nanites are more than just the latest technological advance, they are a new form of life and they have more uses than just medical. Glyer's nanites also have the potential to make everyone on Earth rich from the wealth of asteroids. Now, a much, much larger asteroid is on a collision course with Earth and the Briareus nanites may be responsible. While the government scrambles to find a solution, Glyer knows that their only hope of avoiding Armageddon lies in the nanites themselves. On the run, Glyer must track down his old partner, William Connors, and find a way to make contact with their wayward children. As every parent learns, when you produce a new thinking being, the plans it makes are not necessarily your plans. But with a two-hundred-gigaton asteroid that rivals the rock that felled the dinosaurs hurtling toward Earth, Glyer and Connors don't have time to argue. Will Glyer's nanites be Earth's salvation or destruction? LARRY NIVEN is the multiple Hugo and Nebula Award-winning author of the Ringworld series along with many other science fiction masterpieces. He lives in Chatsworth, California.MATTHEW JOSEPH HARRINGTON is the author of Soul Survivor. He is currently living with fantasy artist Valerie Anne Shoemaker and four cats in San Jose, California.